Plan of Athens, for the Travels of Anacharsis, May 1784. This is an attractive 1784 map of ancient Athens, Greece. Covering the walled center of ancient Athens, this map details the ancient city's most important buildings and monuments. Names the Lyceum (Aristotle's famous school of philosophy) and the Cynosarges (Public gymnasium) as well as the Forum, the Citadel, the Temple of Theseus, and the Areopagus. Prepared by Barbie de Bocage for publication in the atlas volume attached to Jean Jacques Barthelemy's 1788 Travels of Anacharsis the Younger in Greece. 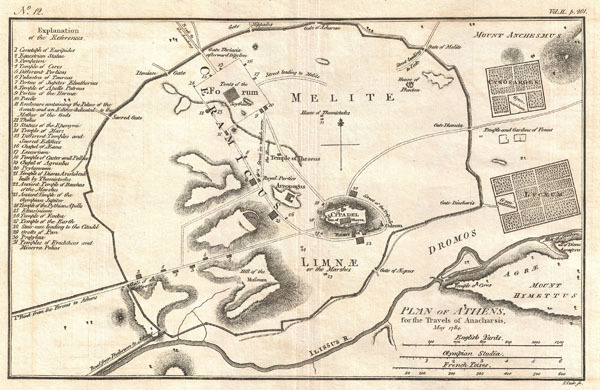 Barthelemy, J. J., Atlas to Accompany The Travels of Anacharsis the Younger in Greece, 1788.